I realize I’m far from alone in this: I love Peter Dinklage. Love him. You know, some people are “personalities” or “stars” and some people are actors, and Dinklage is both. He can melt into a character, but he’s always got a certain through line or backbone that’s just him, a certain self-aware, sardonic and slightly sorrowful aspect that you recognize whether he’s minting battle axes on a dying star or running an evil tech firm or dragon-whispering in a catacomb beneath a pyramid. That consistency, his essential him-ness, had me on alert as I realized I was about to watch him portray Hervé Villechaize, the knife-brandishing, pill-popping French dwarf most widely remembered as Ricardo Montalban’s sidekick on Aaron Spelling’s schlockfest Fantasy Island. Because Villechaize was very much a Personality, with his thick accent and odd voice. And he was… well, kind of treated like a circus sideshow because of his dwarfism, and basically all most of us remember about him is a two-word catchphrase. 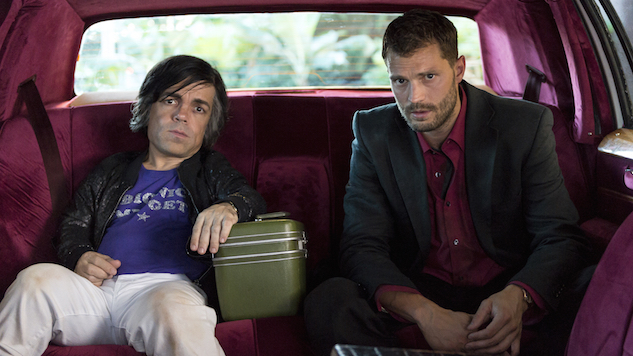 My Dinner With Hervé isn’t a completely fantastic film, but that’s absolutely no fault of Dinklage’s. He’s marvelous. It’s just that the film suffers from the same thing that seems to have plagued Villechaize’s life: being somehow incidental to his own story. Danny Tate (Jamie Dornan), an avatar of writer/director Sacha Gervasi, is a newly sober alcoholic returning to work at an avatar of the Daily Mail and trying to pick up the pieces of his destroyed life when he’s sent to L.A. to interview Gore Vidal and, while there, do a comical short piece on the short guy who became famous as a Bond villain and, later, as the white-suited Tattoo on Fantasy Island. The obviously lonely and unraveling Villechaize takes up so much of his time that he ends up late to meet Vidal, who all but throws his martini in Tate’s face and walks out. Tate ends up on an all-night roller-coaster ride hearing Villechaize’s life story, punctuated with pit stops at strip clubs, bars, and every other place Tate would find triggering in his newfound and hard-to-hold sobriety. But he stays. And is obviously quite fascinated by Villechaize, in whom he clearly sees a kind of contorted mirror image of himself: Where Tate is trying to put his life back together, Villechaize is clearly trying to do the opposite. A few days after the bizarre all-nighter, Villechaize kills himself. Tate’s article suddenly has relevance, but the editor still wants him to… well, make it smaller. Tate walks out, into the unknown, and starts writing Hervé’s story for himself. The film is based on actual events, and in actuality, it’s Gervasi’s story, not Villechaize’s. And I guess that’s fine, but it leaves Dinklage’s sensitive, intriguing, wounded, dissipated and self-sabotaging portrayal of Villechaize as object, not subject. The parallels between the actor and the journalist are a little bit on-the-nose (a super-bummer truth for writers, because the stuff that really happened exactly like that is invariably the stuff people will complain feels inauthentic). And the framework emphasizes Tate’s point of view and his life and his psychological journey much more than the man he’s been sent to learn about, and it feels like a bit of a mistake or at least an unfortunate imbalance. I’m not sure if it’s the relative powerhouse factor between the two actors (Dinklage might be a small guy, but he casts a much larger shadow than Dornan ever could) or the way the script is built. Perhaps it’s both. The premise is a good one—two seemingly opposite yet strikingly similar men meet, and then meet, as in changing one another’s perspectives. And maybe that’s the root of the imbalance, because it’s really only Tate who changes. Villechaize is in a tailspin and doesn’t pull out of it. He didn’t in real life, either, so that part is what it is, but it’s an asymmetry you can’t not feel. Meanwhile, there are some great performances (David Strathairn as Villechaize’s beleaguered agent is a standout, as he almost always is), and a very solid production overall. It’s a story Gervasi has waited a long time to tell (and Dinklage had been attached for years) and by no means is it poorly told. But it doesn’t feel like Villechaize’s story so much as Gervasi’s story about how meeting the volatile, self-destructive actor changed him. That’s a valid story, too. When a famous but marginalized stranger offers you a crazy story of barbaric abuse, parental toxicity, a lifelong struggle to feel seen and heard and the ruthless squandering of everything he gained, and you realize it’s essentially his suicide note, making it about your own experience might feel safer. I’m not sure it’s ideal. My Dinner With Hervé premieres Saturday, Oct. 20 at 8 p.m. on HBO.